The Reuse Centre collects everyday items five days a week, year-round, and makes them available to groups and individuals who will reuse them. Eco Stations Now Accepting Reuse Centre Donations! You can now drop off your Reuse Centre donations at any Eco Station in the city, free of charge. For Eco Station locations and hours, visit edmonton.ca/ecostations. 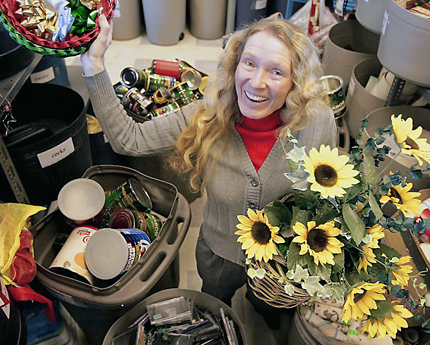 Formerly called Garbage Fairs and Reuse Roundups, Reuse Fairs are one day events where the public bring their unwanted household items to be donated to local organizations. Eco Station Reuse Areas makes items such as furniture, electronics and appliances dropped off by customers available for reuse at no charge. There are Reuse Areas at Ambleside Eco Station and Kennedale Eco Station. City Staff will do a presentation on reuse in your classroom. This is free for all Edmonton schools. Find out more about the "Choose to Reuse" and other Waste Management Services Presentations and Tours. Reuse Fairs have been bringing together communities and charities to collect and distribute needed items for local programs since 1992. Everything about what to do with your waste including what goes where, waste disposal facilities and how to reduce & reuse. Take home reusable items dropped off at the Eco Station Reuse Area.